One of the most important tools in a video production toolbox is a good camera. There are many good choices to be made and each camera has it’s own set of advantages and disadvantages. The camera of choice for us is the Canon C100 Mark II. This digital cinema camera is a workhorse and is on par with what you’d use to shoot a major motion picture. Basically this means adjustable contrast. This feature enables shooting in difficult lighting situations which is usually difficult for traditional cameras. For example, if you shoot an interview in front of a large picture window, the subject can be perfectly lit while the background is easily visible at the same time. The most important part of any camera is the lens. In every case, better glass on the camera means a better looking picture. The C100 accepts prime lenses. A prime lens is a specialty lens used mostly by movie makers and high end commercial production. So this camera and lens combo gets you that smooth, silky, rich “film” look. much easier than with traditional ENG camera packages. When you are shooting on a crowded trade show floor, or in a church, or a hospital operating room, it’s often not an option to set up and use proper lighting gear. 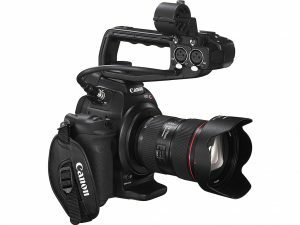 The Canon C100 is one of the best lowlight cameras on the market. We can shoot with available light to acquire amazingly bright and clear images. Kathryn and David Seay are video producers based in the Dallas/Fort Worth area.